Elevation Range: 4,000 - 10,000 ft. Introducing Bryce and Zion: Reloaded. Our new, five-day E-bike Bryce and Zion road cycling tour makes getting around the hilly backcountry a whole lot easier. Our epic weeklong ride begins at southern Utah’s Brian Head resort, adjacent to Cedar Breaks National Monument. Descending off the mountain, we sweep through a beautiful blur of aspen and pine before entering Red Canyon. Here, we transit to a bike path lined with giant sandstone figures: a preview of the dramatic imagery and backdrops to come. At Bryce Canyon National Park—far smaller but far higher than Zion—our path through the forest merges into a rather abrupt opening. We’ve rolled up to the rim of an immense bowl crowded with remarkable stone hoodoos! A short hike into this stone badland brings the channels and eroded spires, their fantastic form and color up close. Leaving bedazzling Bryce Canyon, we’ll ride through striking lava flows to Duck Creek Village. Further on, we’ll hike to an enigmatic waterfall, as well as an ice cave. Closing out, we’ll descend through Long Valley, and ultimately to boundary of Zion National Park. Our grand finale delivers us into the stunning sanctuary of the Three Patriarchs, Angel’s Landing, and the Great White Throne, an uplifting if thoroughly immersive experience. Due to the nature and rules of e-bikes in Bryce and Zion National Parks, all guided rides are done outside the parks. Spectacular sights, a charming old town area and exhilarating recreational activities can all be found at this Quality Inn. The Quality Inn offers charming guest rooms and deluxe suites. Many modern amenities include an onsite restaurant, free Wi-Fi, tour planning and business center in this resort. While we do our best to bring you the above hotel accommodations, lodging may vary depending on your departure date. Call us at 1.800.596.2953 for more details. While every Escape Adventure trip is designed to appeal to active adventure seekers, and in many cases, particular skill levels, there is always a different idea of what that exactly means. That is why we have designed the chart below to help make sure you join the proper tour. We know your pace may vary from one day to the next—and your traveling companions’ may differ as well. We present a range of mileage options on each tour as well as provide support vehicles as much as possible. That way you can take a break and do as little or as much as you would like each day. Find out more about Choosing a Tour. All internal land expenses and services are covered in the cost of your tour. This means from the time we pick you up at our meeting point, until we drop you back off to head home, all transportation, food preparation, meals (except where noted on itineraries), snacks, non-alcoholic beverages, group supplies and community gear (portable chairs, large awnings, coolers, utensils, etc.) are included. Backcountry permits, licenses, park fees, reservations, and accommodations (lodging) are also included, along with at least two professionally trained trip leaders, a mobile first aid and mechanic station, spare bikes, and a support vehicle(s). Trip price does not include airfare, lodging prior to trip start or bicycle rental and/or camping gear (if on a camping tour) unless otherwise noted on itinerary or website. 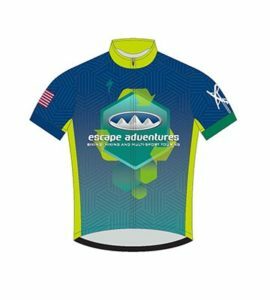 When you join an Escape Adventures tour in 2019, you will receive a FREE custom sublimated Limited Edition Jersey! For those of you who have always wanted to join a bike tour but feared your fitness would hold you or the group back, fear no more. Our incredible e-bike option allows you to do more, go twice as fast and far. The all new Specialized Turbo has one goal and one goal only—to inspire you to get out, get moving, and to have some fun along the way. E-bike available on most casual and luxury inn trips for an additional price. Why travel with Escape Adventures? For over 25 years, the hallmark of an Escape Adventures tour is personalized, hands-on service. Before, during, and after each trip. We are a company of honesty and integrity and we stand behind our product 100%. From the moment you learn of our trips, to the time you return home and start planning your next trip, we are here to bring you the best possible experience. From our Guaranteed Trip Departure Confirmation Policy, making sure your trip is never cancelled*, to our 100% Satisfaction Guarantee Policy, backing the unrivaled consistent quality of all our tours, our commitment to you is never compromised. * Scheduled Domestic trips only. Our environmental commitment is second to none. We run our tours the same way we run our company, with an eye on the triple bottom line: People, Profit & Planet. At Escape Adventures, we elected to pursue a more comprehensive approach to actually reduce our carbon footprint, rather than just offset it. We overhauled our entire operation — from our vehicles, to our buildings, to our procedures — to become an outdoor industry leader in the charge to help our people and our planet. Leading tours naturally followed from our passion of exploring our favorite places with our friends. Our support staff includes our reservation team who is there to answer your questions about the tours, our service team who prepares your bike and gear for the tour, and our guide team – the ones who take you into the great outdoors. The highest level of responsibility, good nature, integrity, and dedication are standard traits of all those who work at Escape Adventures. We our proud of it and we think you should know it. Having custom-made vehicles allows us to take you to places few other outfitters can, or will go. Every Escape Adventures tour is accompanied by at least one support vehicle, trailer, and in some cases a second and third transfer van. After purchase, we custom engineer our trucks, vans, and trailers by our on-staff mechanic to meet the unique needs of different tours. For example, certain vehicles are specifically designed for the Canyonlands region of Utah, while others are designed for The Grand Tetons and Yellowstone. Each of our Trip Leaders is required to be trained in safe vehicle operation, 4X4 driving, and basic maintenance. Our experienced Trip Leaders make it look easy, transporting you and up to 12 guests, along with their bikes, fresh food, gear and plenty of drinking water to any location. Make your trip as comfortable as possible on the body, as simple as possible for traveling, and hassle-free on tour. By choosing to rent a bike from us, we will fit you with the newest, highest quality gear in the industry. Escape Adventures provides only high-end bicycles from Specialized. We replace our rental fleet each season to ensure all our rentals meet our high standards. All of our bikes are equipped carbon fiber frames and disc brakes designed for a smooth, comfortable ride. For those who are touring with a companion who may not be as fit or need a little help up the hills, we now have ebikes (electric pedal assist) available on select tours. Our food isn’t just good, it’s good for you. Food represents a big part of the Escape Adventures experience. On our inn tours most dinners and breakfasts unfold at local favorite restaurants. We also have energy snacks aboard our support vehicles. Don’t be surprised if your guides purchase fresh fruits and healthy snacks throughout the day while you’re enjoying a ride. They may just show up on the trail with a local treat! An increasing number of our guests are vegans or vegetarians, whom we not only accommodate but also pleasantly surprise. Should you possess special diet requirements and/or limitations, just let us know at sign-up. We’ll work with you to meet those critical needs. The idea of taking your friends or family somewhere cool and amazing is actually pretty easy. Tell us what you’re thinking. We’ll make it happen. To shape a Custom or Private Trip, we begin a dialogue: first, to develop a group specific itinerary, tailored to respective abilities and preferred tempo. Next we schedule, bookmarking and working in your optimum or ideal getaway dates. Size-wise, we can build a multi-day trip for as few as two people, scaled up to as many as 30 plus. Contact us today to start the custom trip building process. All Private Escape Adventures Trips are priced in the structured method below. Some Custom tours are priced differently if they vary from the Classic Escape Adventures itinerary and price. In this situation we will provide your group with a custom itinerary and price. * Pricing, availability and guest minimums are all subject to change at any time. Certain dates have a minimum number of guests required, please contact us for details.